A number of hospital and transplant organization webpages and even entire websites were deleted after the first Kilgour/Matas report was released in 2006. In addition, we observed that some hospitals merged their dedicated transplant departments and centers back into their parent departments, such as hepatobiliary surgery, urology, etc. The more generic departmental structure obfuscates any remaining information regarding transplant resources and capacity. 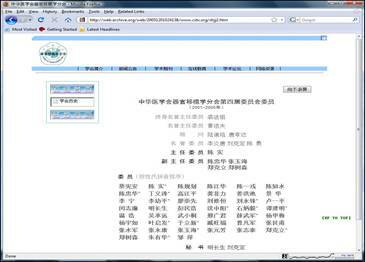 The Chinese Medical Association Society of Transplantation website, before it was taken down in April 2006. The Society of Transplantation website (http://www.cstx.org/) under the Chinese Medical Association (http://www.cma.org.cn/) became inaccessible shortly after the harvesting of organs from Falun Gong practitioners was first publicized on March 9, 2006. Searching for the Society of Transplantation website stored on www.archive.org reveals that the website was taken offline in April 2006. We also found a listing of active transplant-related websites published in 2004 that are no longer accessible,1 including China Organ Transplant Online established primarily by Beijing Chaoyang Hospital’s Urology and Kidney Disease Center, Transplant Space by the First Hospital of China Medical University’s Organ Transplant Research Institute, the Chinese Renal Transplant Collaboration website by Zhengzhou Central Hospital’s Kidney Transplant Department, and the Central China Military Renal Transplant Collaboration website operated by the People’s Liberation Army Hospital No. 460’s urologic surgery department, among others. Clicking the link to the report results in the message, “The content you are looking for has been deleted, renamed, or is temporarily unavailable.” Other articles in the same list were still accessible. A link to the deleted report “Our Hospital Again Sets a New Record in Organ Transplant Surgeries” on Xiangya Hospital’s news portal. Other hospitals also deleted information regarding their transplantation activities, capacity and personnel from their websites. "Domestic Online Organ Transplant Resources Source: Hbver.com. June 10, 2004. Source: Health News." "Completed 17 transplants one day, does Changsha have an organ allocation system?." "Xiangya Hospital of Center-south University. June 22, 2006." "“Xiangya Hospital Organ Transplantation Sets New Record: 17 Transplant Surgeries Completed in One Day.” Central South University."